Saint Lucia is no ordinary island. Her mountains, jungles, beaches, and historic sites whisper echoes of her history to all who visit. Every cliff or buttress tells a story about the island, adding to the personality and nature of St. Lucia and those who live here. It’s impossible to see everything on the island during your visit, and many people live here for years without uncovering all of her mysteries, but there are a few St. Lucia landmarks that you shouldn’t miss when you are here. Start your exploration of Saint Lucia’s famous landmarks with the Pitons, two volcanic plugs on the southwestern coast of the island. Each Piton has its own name: Gros Piton (at 2,530 ft high) and Petit Piton (at 2,438 ft high). These landmarks actually inspired the creation of a local beer, Piton, a light, refreshing drink popular with locals and residents alike. There are multiple ways for visitors to explore these landmarks. You can hike around them and see exotic plants and animals that call the area home, or you can sail around them to see the Pitons from the water. Many guests to Saint Lucia prefer to do both, as they are captivated by the beauty and shape of the dormant volcanoes along the coast. AS THE PITONS STAND WATCH, flora and fauna whisper island lore carried on tropical breeze from the rainforest to the silky shores. The heart of Saint Lucia can be felt everywhere. If you want to combine history and nature in your visit, then Pigeon Island is one of the top Saint Lucia landmarks for you. Pigeon Island was a separate isle until 1972, when the government built a causeway between it and the main island for easy access. Pigeon Island is where the infamous pirate, Jamb de Bois, created a camp to ambush Spanish trade ships. Visitors can also climb around the ruins of Fort Rodney, which was built by the English to fight the French. Hike around the ruins and pass cannons while you watch nature slowly reclaim the island. You can really feel what it was like guarding the island in the 1700s. Pigeon Island is a National Park of Saint Lucia, and you can find visitors snorkeling, sailing, and diving just off the shores. Of all Saint Lucia’s most famous landmarks, Soufrière is one of the most recognizable. The town’s name comes from the sulfurous aromas created by the volcanoes. Explore the town square and get to know the culture of Saint Lucia (while shopping for a few souvenirs along the way), or head out to some of the natural wonders of the islands. The Saint Lucia Diamond Falls Botanical Gardens are also located in this town, and some visitors use Soufrière as a base to hike out to Toraille to cool off in the natural rainforest. 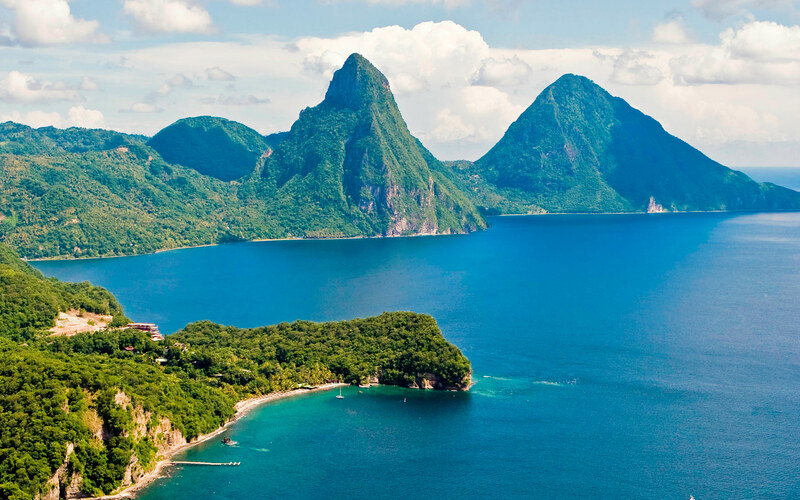 The best way to find iconic landmarks of Saint Lucia is to ask the people who live here. Everyone on the island has a favorite diving spot, hiking trail, or historic ruin that paints a picture of the island’s culture. These landmarks are a great place to start, but there’s so much more that the island has to offer.